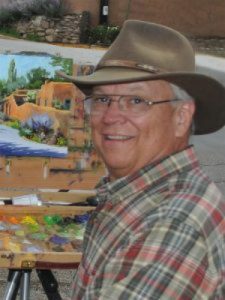 Mike’s yearly workshop in Taos is always an anticipated event for his followers, but this year it will be very special! 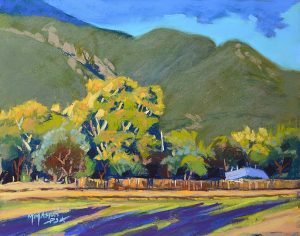 The El Monte Sagrado Hotel will be honoring Mike with a FREE Reception/ Painting Demonstration in their beautiful Gallery Room, on Tuesday, October 16th, from 4:00-6:30 pm. 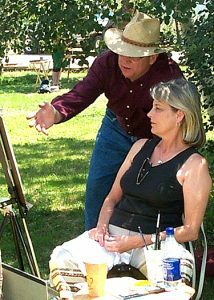 Since this 2018 Workshop is a week later in the year than usual, Mike will be painting as close as possible to plein air circumstances, while still allowing students a controlled learning situation. 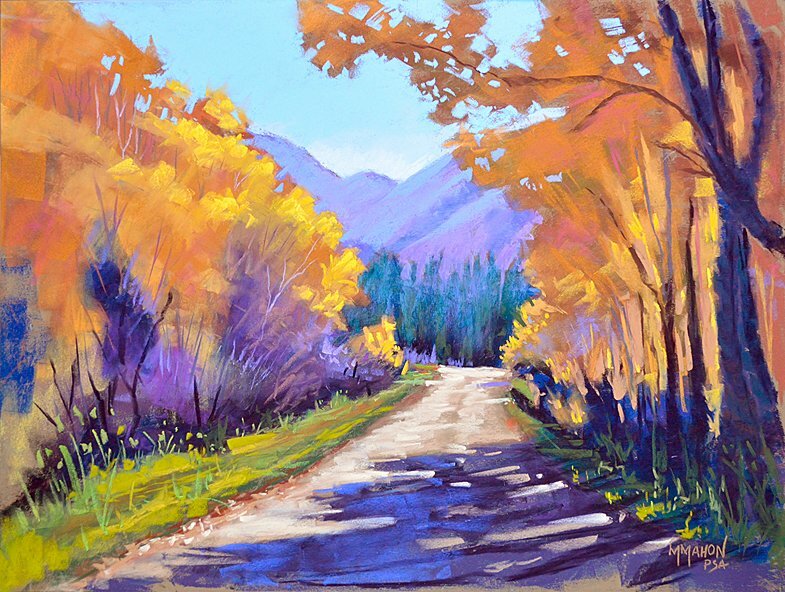 In the Paint–Along session, Mike will supply each student with a photo identical to the one he is using. 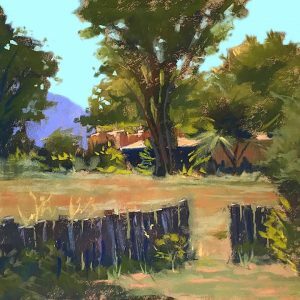 The photo will be of a Taos scene similar to what you will be dealing with when we go into the field to paint the next day. Mike will demonstrate his step-by-step painting process, stopping at each step to allow students to reproduce what they have just seen him paint. 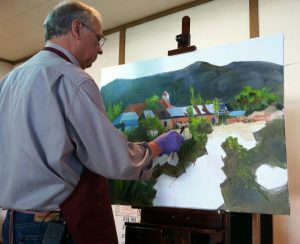 He has found that this is the fastest and most effective way to build confidence while learning his painting method. Mike will help you set up your equipment at the Paint Along exactly the way you will need to use it in the field. This gives you an opportunity to test your equipment and painting technique under Mike’s supervision. 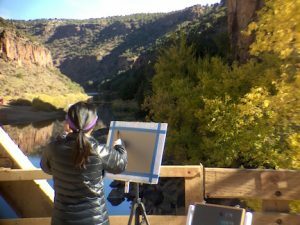 If you find that you need any plein air painting supplies, there will be time to get them before going to our painting location. They have a block of individual casitas set aside for us at $159 per night. This is a significant savings over the high-season prices. However, you are not required to stay at El Monte Sagrado to attend the workshop. This painting video has been compressed to only 17 minutes, but it includes Mike’s audio commentary explaining his painting process, along with helpful painting tips. You may view the video whenever and as often as you like. 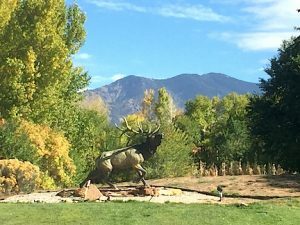 Is there still room in your October 2018 workshop? Lucy, There are still 1 or 2 spaces left. Just click on the “register now” button above and at this late date you will need to pay the full registration fee. If you plan to stay at the El Monte Sagrado, please contact them right away to see if you can still get the workshop discount. If you have any questions, don’t hesitate to ask. 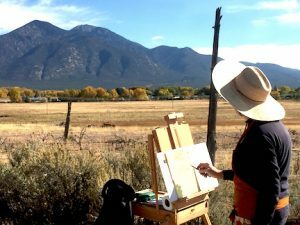 Do you know the dates of your 2019 plein air workshop? I’m trying to schedule a hiking outing in northern Minnesota, and currently, I am in Conflict with your 2018 plein air dates. 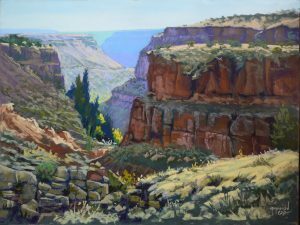 Lucy, the dates for the 2019 Taos workshop have not been finalize but expect to do that in next few days. However, I think it will probably be the week of October 14, 2019. 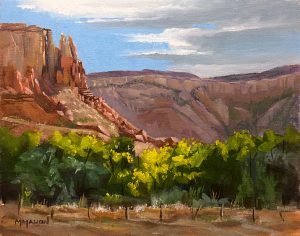 The dates for the Santa Fe Plein Air workshop in 2019 have not been finalized but I expect it to be the week of October 14. I should know in next few days.